Revenue in the Accessories market amounts to US$410,657m in 2019. The market is expected to grow annually by 1.6% (CAGR 2019-2023). In global comparison, most revenue is generated in China (US$109,430m in 2019). In relation to total population figures, per person revenues of US$55.79 are generated in 2019. The Accessories market comprises wearable, fashionable accessories that complement a person's outfit such as Watches, Jewelry, Suitcases, Bags, Wallets, Handbags and other containers for private end consumers. Like the Apparel market, the Accessories market relies heavily on imports. Some significant production still exists in Italy, France, and Spain. This market includes both fashion jewelry and high jewelry of precious materials such as gold, silver, or titanium. Therefore, both non-branded items and brands such as Rolex, Cartier, and Louis Vuitton are covered. As a consequence, the differences in price levels are considerable. There are also disparities with regard to distribution, as accessories can be bought from exclusive, expensive luxury boutiques, brick-and-mortar multi-label businesses (department stores), vertically-integrated clothing companies (H&M, Primark) as well as e-commerce or mail order companies. The Accessories market does not include watch parts or watchbands, non-wearable items or protective bags and cases for electronic devices such as notebooks or cameras. Reading Support Revenue in the Accessories market amounts to US$410,657m in 2019. 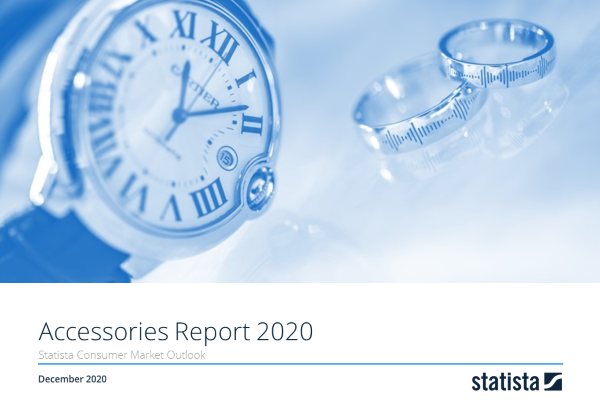 Reading Support The Accessories market is expected to show a revenue growth of 1.9% in 2020. Reading Support The average revenue per person in the market for Accessories amounts to US$55.79 in 2019. Reading Support With a market volume of US$109,430m in 2019, most revenue is generated in China. Here you can find more studies and statistics about "Accessories".